I’ve been working with personal computers and the applications that run on them long enough to remember the ten-pound box of manuals that accompanied major applications like Lotus Notes, dBase II or Microsoft Office. The bad news is that over the years, the documentation has gotten slimmer but the applications haven’t gotten any more intuitive than they were way back when. The good news is that tech columnist David Pogue has stepped in to fill the gap with his “Missing Manuals” series. 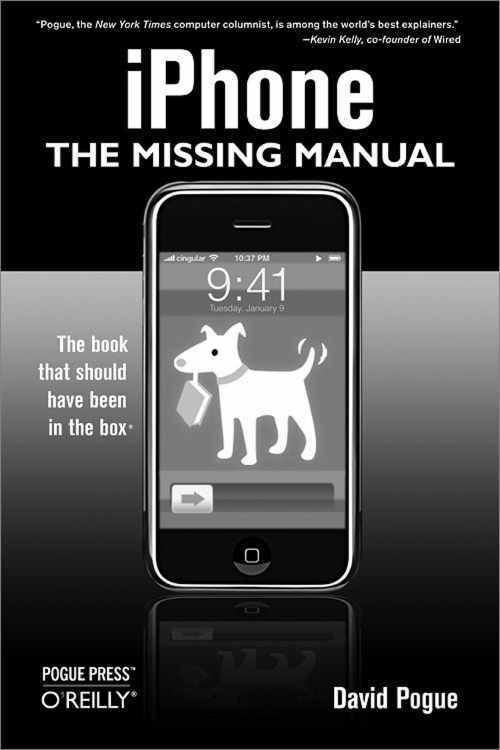 The latest is iPhone: the Missing Manual. Now, the iPhone itself is pretty intuitive. You know it’s a phone, so you have to hold it up to your ear, and I suppose that’s why Apple has included a small foldout leaflet, called “Finger Tips,” to get you started (get it? - you use your fingers to operate the phone). But that’s where the intuitive part stops. If you want to make full use of all the iPhone’s many splendid features you’ll need more than that thin leaflet. Granted, Apple also provides a link to a downloadable PDF user guide. This PDF covers the basics but it doesn’t include the details, like hacks, workarounds and tutorials. Neither can you make notes on it or take it to the bathroom with you. With a logical progression from the basic functions to the more esoteric, Pogue introduces you to your phone in Part 1 and gives you a guided tour of the minimal interface and the four external buttons and switches: Sleep/Off, Silent ring, volume and home. Everything else that you can do with your iPhone is hidden behind the screen. After your guided tour, you learn how to make phone calls and set up your contacts, use voicemail, text messaging, chat, caller ID and call forwarding. As for voicemail, as expected from Apple, the iPhone does not do it the same way everyone else does. AT&T touts something they call “Visual Voicemail”, which in effect is just a list of voice mails received by your phone. There’s no menu tree to go through and no listening to ten boring callers before you get to the one important message because all your calls are in a list and you can listen to them in any order – or kill off the uninteresting ones without listening to them at all. In Part 2, Pogue shows us how to use the iPod part of your iPhone so you can listen to music, watch videos or view photos. Your iPhone has the standard iPod functions of Play/Pause, Previous/Next and Volume, but also has three hidden controls that don’t appear until you tap on an empty part of the screen: a Loop button so you can play “Chocolate Rain” over and over again, a Scroll Slider which operates the same way the iPod scroll wheel works when you click on the center, and a shuffle control to play the songs in an album in a random order. A nice discovery is that you can still listen to the iPod function even if the iPhone is doing something else, like surfing the web. It will even continue to play if you tap the Sleep/Wake switch on top. The music will keep playing, but you’ll save battery life. Like any recent smartphone, the iPod also has a camera and can store photos and video. Even though the camera is two-megapixels, I found that the picture quality is quite basic and leaves a lot to be desired in low-light situations or any scene that has more than minimal movement. Part 3 covers online connectivity: getting online, using Safari, email, Google Maps and other applications that come with the iPhone. Safari on the iPhone is just beautiful compared to other smartphones. The best part of this section is the wisdom that Pogue imparts on how you can survive email overload. The mail app is a very full-fledged email program for a phone. However, compared to a desktop email program it is only half-baked. You can’t send file attachments, create mail rules, delete messages en masse - and worst of all, you can’t screen out spam. The solution is to set up a Gmail account and have that account collect your email from your regular email address, but leave the mail on the server. Then have Gmail forward all your mail to your iPhone. The trick here is that Gmail has excellent Spam filters so your mail should be relatively free of spam when it reaches your iPhone. I, for one, think that tip is worth the entire price of the book. Part 4 covers using iTunes on the iPhone, syncing the iPhone, add-ons, Web Apps and the settings widget. There are some very nice Web Apps that have been developed since the publication of this book. Also, now that Apple will be releasing the Software Development Kit in February, we can expect to see a lot more apps that we can download to our iPhones. Pogue also covers a new breed of Web sites that didn’t exist before the release of the iPhone: iPhone application launchers. Since the iPhone currently won’t accept any new applications these sites are aggregators of Web applications that allow you to run them all from one place. Part 5 has two appendices: a) Setup and Signup; and b) Troubleshooting and Maintenance. The best part is the battery-life tips. You could download the PDF iPhone manual from Apple and learn 75% of what's covered in this book. In fact, I would recommend that you do so regardless of whether or not you buy this book. However, if you want to learn the other 25%, the part that Apple doesn’t tell you about, and if you want a non-Apple-biased view of how things work or don't work, then iPhone: The Missing Manual will give it to you straight.